© 2017 - 2019 Thornwood. Located just above your favorite shopping and dining, the Market Row Lofts offer unique options for your apartment home. With convenient parking and 25 distinct units, you are sure to find your place in these urban-chic spaces. Pick from one of the 25 unique floorplans situated above Market Row. 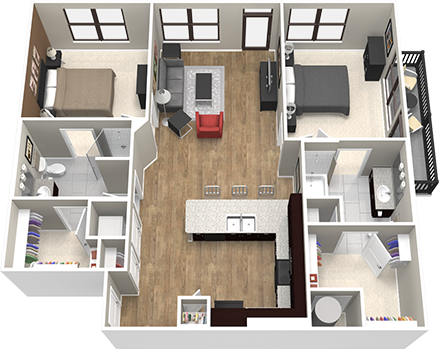 Each is uniquely designed to suit your needs and features a laundry room, pantry, multiple bathrooms, and 1-2 bedrooms. Units with a designated Study are also available. Thornwood’s surrounding community is dotted with horse farms, parks and playgrounds, as well as many leading medical institutions, luxury retailers and tempting dining options. From the rich cultural experiences at the nearby Germantown Performing Arts Center to the open spaces of the Municipal Park, there’s much to experience with easy walking or biking distance. McNeill Commercial Real Estate | 901.322.4809 | Interested in becoming a tenant? Contact us here. © 2017 - 2019 Thornwood. All Rights Reserved.